Deepen the conversation about food, energy, and the environment. 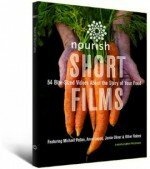 These award-winning films offer a compelling vision of a sustainable future. With beautiful imagery and engaging stories, the programs move from a global perspective to personal action steps. Hosted and narrated by actress Cameron Diaz and featuring a gallery of youth voices, these DVDs promise to spark the imagination and inspire meaningful change. Astronauts in the Space Station. Villagers in the Amazon. An actress in Hollywood. What do these people have in common? Circling the globe, this award-winning half-hour program explores the enormous potential of a clean-energy future. Read more and watch the trailer. If you have a question about which edition to purchase, please contact us. If you want to purchase Power Shift only, order here. 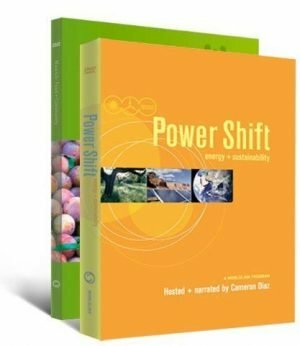 Power Shift: Energy + Sustainability explores the abundant possibilities of clean, renewable energy. This beautiful, inspiring program travels the world to discover how energy touches our daily lives. 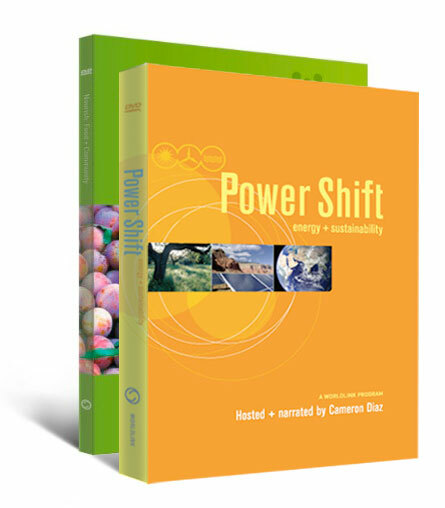 Power Shift offers specific action steps that viewers can take to create a sustainable future. Hosted and narrated by actress Cameron Diaz. Features interviews with Cradle to Cradle author and architect William McDonough, and other sustainable energy and design experts. Contains the award-winning PBS television special (26 minutes), with more than 700 broadcasts to date. Winner of the World Medal, New York Festivals; Best Video, American Library Association; CINE Golden Eagle; and Grand Prize, Ekotop Film Festival. Connections: Travels the world to illuminate the many facets of energy and sustainability. By connecting seemingly unrelated people and places, the segment demonstrates the interdependence of our global community. Weaving together such themes as renewable energy, energy efficiency, and climate change, “Connections” reminds us to think global and act local. Cradle to Cradle: Profiles architect and Time “Hero for the Planet” Willliam McDonough. Through his poetic speaking and graceful metaphors, McDonough shows how the ecological design of buildings and industrial processes will revolutionize our work and lives. Energy Path: Answers the question: “When I turn on the light in my room, where does the electricity come from and how does it reach me?” Beginning with a wind farm, we follow the route of electrical energy as it makes its way to our homes and communities. Be the Difference: Recaps our narrative journey and offers specific action steps that individuals can take. Examples range from driving a hybrid-electric car to requesting green power from local utilities. Speaking Out: Appearing between the four segments, “Speaking Out” serves as a forum for youth to express their aspirations about clean energy.